It’s impossible to talk about any company in tech and avoid mentioning the word “digital.” But how does that concept play out for companies who may have made the jump to digital, and are still planning out their digital strategy? 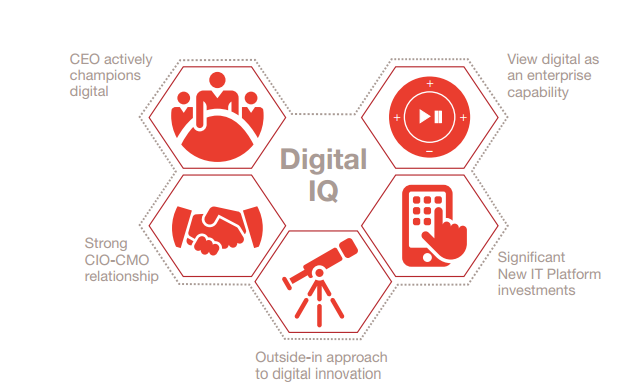 In a PricewaterhouseCoopers (PwC) report released this spring, researchers surveyed about 1,500 business and IT executives from 36 countries, getting their views on what it means to have a high “Digital IQ.” The term refers to an organization’s ability to understand, value, and integrate technology into the enterprise – giving it a leg up over its competition. This is the sixth such report from PwC. Five interdependent digital behaviours that make a difference. (Image: PwC). The companies that were ranked as top performers, or the ones in PwC’s top quartile for revenue growth, profitability, and innovation, tended to be engaging in all of these, researchers noted. In the report, 81 per cent of top performers said their CEO was heavily involved in the organization’s digital strategy, versus just 68 per cent of the companies that weren’t considered best-in-performance. But that doesn’t mean the CEO can work alone. Where there’s unity in the C-suite, there’s a higher chance the company will have a stronger performance, PwC’s report found. Companies where the CEO, CFO, CMO, and CIO worked well together were companies that were 2.4 times more likely to be top performers. Even more striking, however, was the stat showing companies of all rankings value a strong relationship between the CIO and the CMO. About 70 per cent of the top performers said their CIO and CMO worked closely together, while just 45 per cent of other companies said the same. “The CIO-CMO relationship is so important because a great many digital technology initiatives like those for mobile apps or customer analytics are driven by marketing needs,” PwC researchers wrote. Researchers added it’s important for CIOs and CMOs to collaborate, especially when it comes to spending money. For example, investing in cloud and collaboration tools might seem like a brilliant strategy within the marketing department, but the IT department would probably have more than a few concerns about data security. PwC’s report also covered what an “outside-in approach” for innovating might look like. While most companies are probably going to stick to internal planning sessions and workshops to get their employees’ creative juices flowing, some of the top performers have been looking outside their organizations for the next big thing. “It’s crucial for the companies to effectively filter and discern which emerging technologies will be the most disruptive to their unique company, market, and customers,” researchers noted in their report. They added top performers were also more likely to work with universities and other third parties to build up their fount of innovative ideas. Still, there are some areas that businesses need to be investing in now, rather than waiting to see how they pan out. Among today’s IT platforms, some of the ones that stand out right now are mobile customer technology, private cloud, data mining and analysis, social media, and cybersecurity. The ones that may be worth shelving for now would include gamification, NoSQL databases, and wearables, according to survey responses. Finally, digital needs to be seen as an enterprise capability, rather than just another function within the organization. Among the top performers surveyed, they usually had stronger skills in enterprise architecture and user experience design, but they also understood more traditional areas like project management, strategic partner management, and business requirements management.